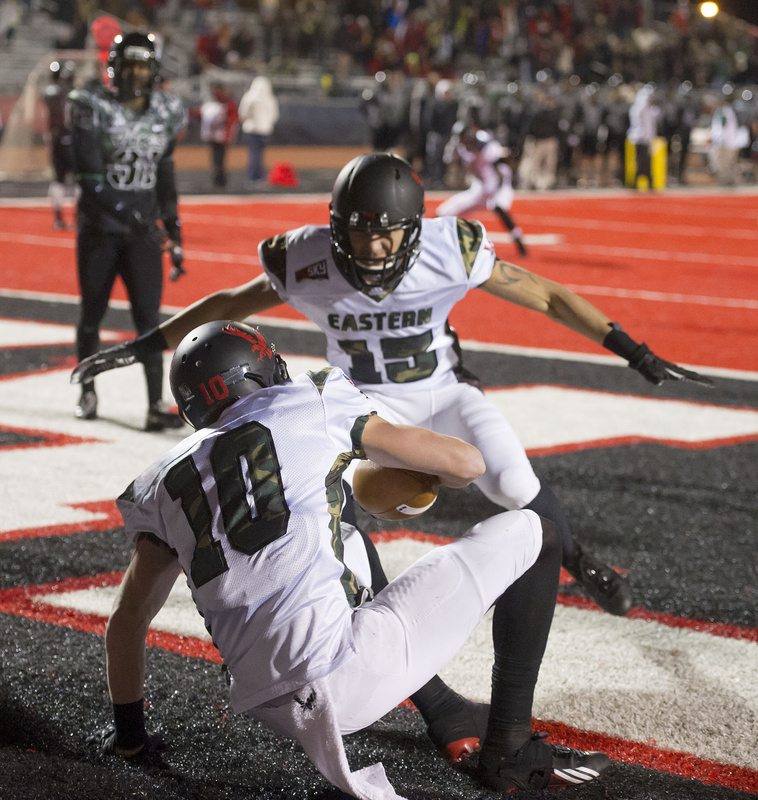 Last year, the Eagles got 2,924 of their 5,247 receiving yards (or 55.7 percent) from just two players: the graduated Ashton Clark (1,233 yards and 10 touchdowns) and All-American Cooper Kupp (1,691 yards and 21 TDs). Assuming Kupp, now a redshirt sophomore, gets more attention this year from opposing defenses, it will be up to others to pick up the slack. That includes senior Cory Mitchell (47 catches, 699 yards last year) and junior Shaq Hill (38 catches, 790 yards), plus veteran Blair Bomber – all of whom can expect to line up in Eastern’s four-receiver sets. The Eagles will also count heavily on true sophomore Kendrick Bourne, who played extensively last year; redshirt freshman Nic Sblendorio; and as many as two true freshmen. Running back Quincy Forte (23 catches, 279 yards and three TDs) also is a receiving threat, though the rest of the returning backfield caught just five balls for 53 yards. No position is getting more attention from fans than cornerback, where the Eagles lost All-American T.J. Lee, starter Ronald Baines and top backup Bo Schuetzle. D’londo Tucker was lost to injury during the offseason, meaning that the Eagles don’t have a single cornerback who’s played the position for the Eagles before. Eastern took out some insurance with Arizona State transfer Rashad Wadood; other candidates are mostly redshirt freshmen, including Jake Hoffman, Victor Gamboa, Moe Roberts and Keonte White; and junior Frank Cange. The safety position appears more settled, but veterans Tevin McDonald, Todd Raynes and Jordan Tonani each missed all or part of last year because of injury. What will that mean on the field? Perhaps the Eagles will blitz more often to give opposing quarterbacks less time in the pocket. Last year the Eagles could count on a pair of 320-pounders in the interior defensive line. But Andru Pulu and Will Katoa have moved on, leaving in their wake a group that may have less heft but more athleticism. Senior Dylan Zylstra (285 pounds) and true sophomore Matthew Sommer (310 pounds) anchor a D-line that gets most of its strength from numbers – and not the ones on the scale. The Eagles usually rotate nine or 10 players on the line, helping keep players fresh for the fourth quarter and building quality depth for the future. Backup tackles Ashton Boothroyd (285 pounds) and Jordan Pulu (280) offer that depth this year. At defensive end, the Eagles will lose starter Evan Day for much of the season after he suffered an ACL injury in spring ball. For the fourth year in a row, then Eagles are taking on a team from the Pac-12. This year it’s a Sept. 6 date at Washington and a chance to duplicate last year’s 49-46 win at Oregon State. The game offers added motivation for the Eastern players, many of whom grew up in the Puget Sound; it also offers a chance to atone for a 2011 loss at Husky Stadium, when the Eagles dominated statistically but lost on the scoreboard 30-27. Eastern is 9-22 all-time against current Football Bowl Subdivision schools, but 2-2 in its last four games. Last year’s win in Corvallis was the Eagles’ first against the Pac-12.